There are countless reasons it pays to have a power inverter on you. Some people need it for their business. Most of us have a nightmare about being stranded with our car and not having the power supply we need to work an important appliance. Of course, for a lot of us, we just want a way to watch the game while we tailgate or bring other creature comforts with us camping. If any of these sound like you, the Power Bright APS600-12 is definitely worth your consideration. This affordable and compact unit does not skimp where wattage is concerned, so it’s a great unit to have on hand in case something goes wrong. 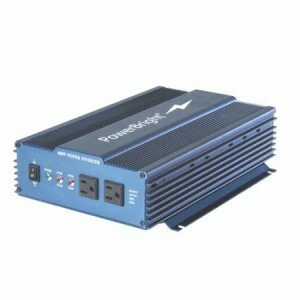 The power inverter can hit 1,000 watts and offers 600 watts at a continuous rate. With this much power, it’s a perfect choice for those who need to be away from a conventional source of energy, but still needs their laptop, television, gaming console or other form of electronics to work. Any small appliances you may keep in the vehicle for emergencies will also get all the power they need from this unit. Aside from the wattage this power inverter can produce, one of the nicest features is how consistently it can do it. So if you’re trying to watch the big game, you don’t have to worry that your television is going to go through starts and stops or otherwise provide you with a choppy signal. Just sit back, relax and enjoy the show. Another thing that we noticed about the APS600-12 Pure Sine Power Inverter is its durability. You can tell this inverter was built to take the type of normal wear and tear that could come from sitting in the back of a truck bed or otherwise hang out in a garage until needed. It comes with an anodized aluminum case for heavy duty protection no matter what kinds of conditions you put it through. Lastly, thermo cooling fan that comes with it is great. It is built-in, so you don’t have to do anything other than turn the unit on and enjoy the wattage. This fan will take care of keeping the power inverter’s temperature at a reasonable level, so you don’t suffer poor results simply because you want to use the machine for a prolonged period of time. Considering all you’re getting with this machine, the price tag is more than reasonable. You can find great prices if you look online. If you shop around you’ll find that a unit this size from a brand like Power Bright usually goes for nearly twice that amount. So you can either save the money or spend it on another appliance you plan on powering. Either way, you come out ahead. The Power Bright APS600-12 Pure Sine Power Inverter is a smaller machine that comes with an even smaller price tag, but don’t let that fool you. When we tested it we realized that this unit packs a serious punch that will make you glad to have it around. Overall it gets a rating of 4 out of 5 stars!